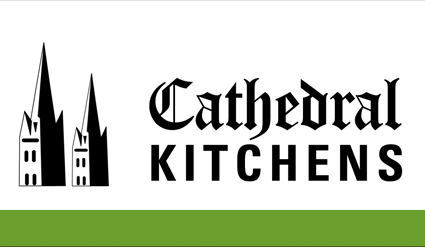 Cathedral Kitchens is based in Long Ashton in Bristol. We offer a friendly and professional kitchen fitting service to all of our clients and use quality products, materials and most importantly our crafts and tradesmen take pride in ensuring that your kitchen is fitted and finished to the very highest standards. In your initial consultation we will discuss what you like about your current kitchen, which features you want to retain and consider the functionality do you want – this will help make decisions about plumbing etc. Whilst we are more than happy to follow any ideas you have, we will also offer other ideas that you may not have thought of. 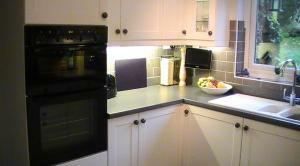 Cathedral Kitchens and all their tradespeople are fully insured. We are able to provide sample doors, worktops and brochures to help you achieve the perfect kitchen – all doors are custom made to measure. 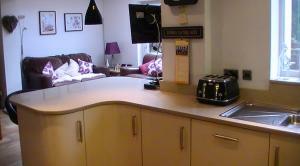 Work surfaces offered include granite, wood or laminate and whilst we supply and install the latter, granite surfaces are sourced from The Avon Marble Company, who will template and fit them (we are able to provide you samples of these). We can also help with purchasing new appliances, or we are happy to work around existing ones if preferred. Once we have taken all measurements of the kitchen, will be able quote for initial units, plans, fitting etc.lick on this text to edit it. We are aware that whilst the work goes on, that you still be able to need to use your home – we aim to cause minimum disruption and accommodate you and your family as far as possible. Things we do to try and ensure this include loaning you a baby belling cooker, leaving old units out for storage and laying a carpet rather than dustsheet for you to walk on. 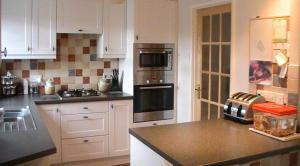 Please feel free to browse through a selection of the kitchens we have recently built.